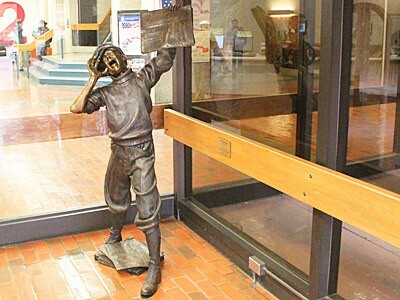 This bronze sculpture was donated to the UA Library in 2009. Here the newsboy is holding a newspaper that says TRUTH on it. Does it seem antiquated? Is there a relationship between the word TRUTH and the mission of a library system? Bronze sculptures by James Muir are typically realistic, figurative artworks with allegorical references.